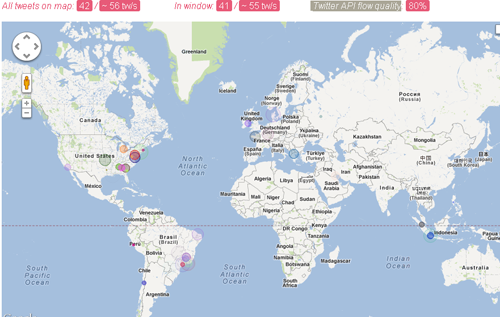 The application presents several interesting facts such as the number of tweets currently represented on the map or window along with the tweets per second that are emerging and quality of use of the Twitter API. If you think about it, is not a true figure of all tweets that are emitted per second, as the actual number is much higher, what happens is that the application can only count those tweets with geo tags. There are two types of tweets on a map: it presented with exact coordinates and presented with a diversion of up to 1 degree (these are more transparent). At the bottom of the map we have several controls that can adjust to display tweets differently.